Remember those Hershey Kiss roses we made as kids? 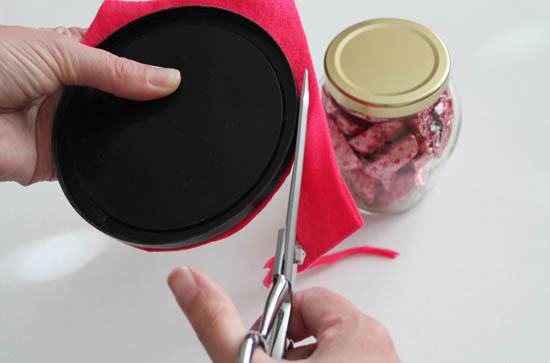 Those roses are about to be replaced with the latest in DIY Valentine’s Candy giving – the giant Glass Jar Rose… which can be made in 30 mintues or less! 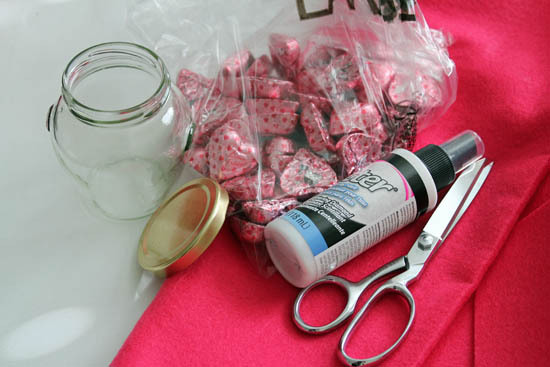 You can fill the jar with your favorite Valentine’s candy, whip up the rose, and be ready to impress! 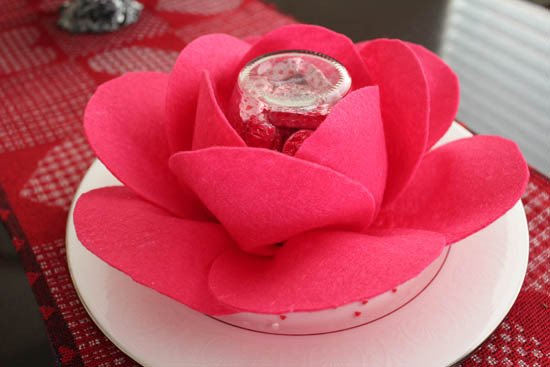 These big felt roses look great as part of a place setting or on their own. Glass Jar with lid (the Honey Pot from Freund Containers is the perfect shape) updated: I used the “10 oz 314 ml” size – those are 3.8″ tall. 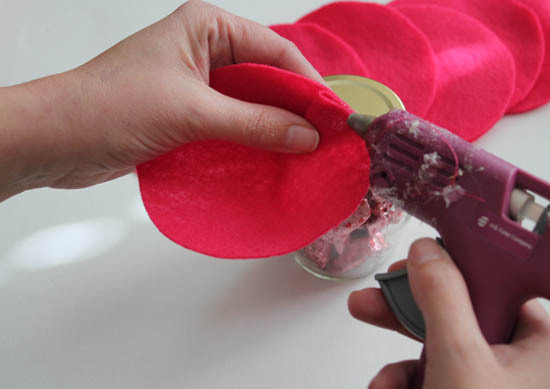 Rose colored Felt (1/2 yard cut off the bolt is enough for 4 roses) Pink, red, or white are all great choices. 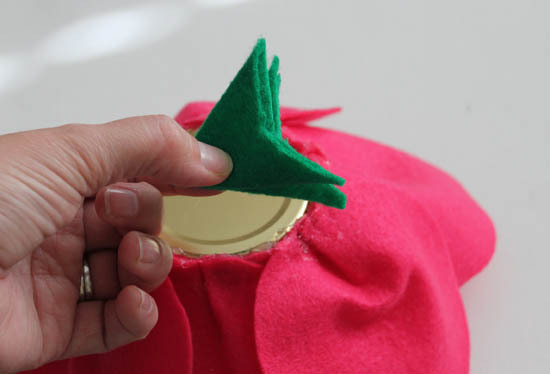 Start by using the lid as a template to cut 12 felt circles from the rose colored felt, and one green circle. I cut a double-layer of felt, cutting out 2 circles at the same time. I folded one edge of each circle, overlapping an area about an inch wide. I put hot glue between the layers to secure them, and then hot glued the petal to the edge of the lid. 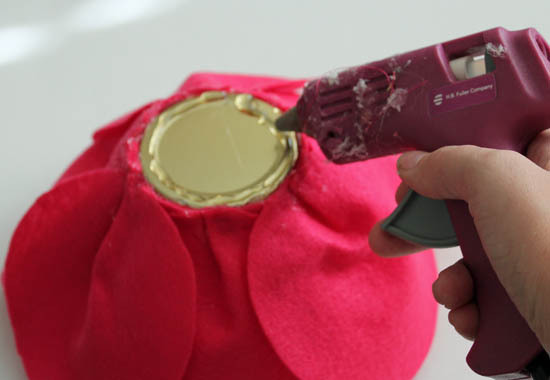 note to self: I really need to get a more photogenic glue gun. I started out with three petals, evenly(ish) spaced around the jar. For the next layer of 3 petals, I only overlapped the circle about 3/4″. I put these petals between the first 3. 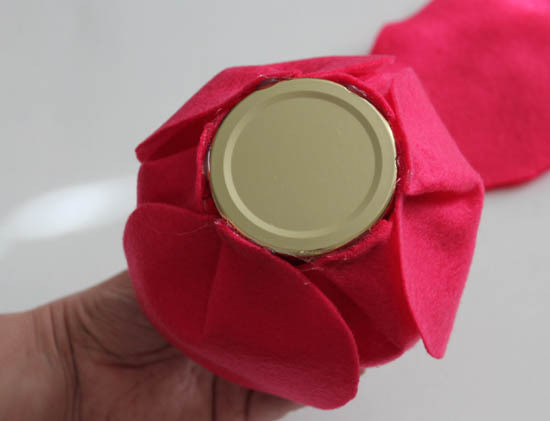 For the final 6 petals, I overlapped the felt a 1/4″, and evenly spaced them around the jar. 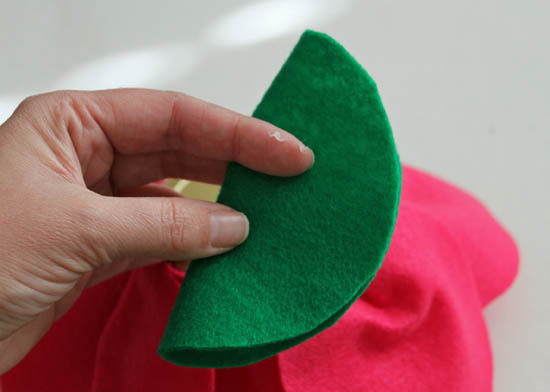 Then it was time to cover the lid, I folded my green circle of felt in half. I then folded it into thirds, and cut a wedge out of the top. The deepest part of the wedge should only go in about 1/4″. I unfolded the circle and glued it to the top of the lid. I added a dab of glue to the end of each of the green points as well to secure them. After turning it over and playing with the petals, I added one last touch with a little shimmer spray. … and I haven’t even told you the best part yet! 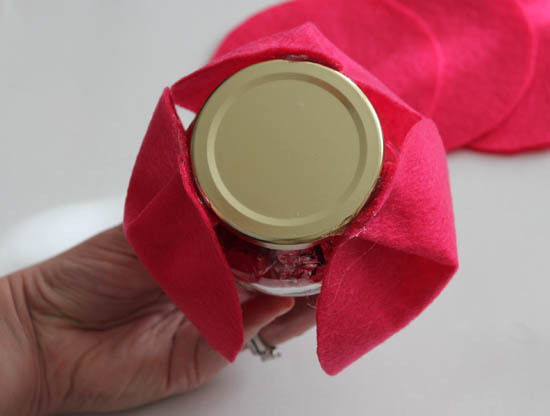 Since all the petals are glued to the lid, you can still twist the lid off the jar, snack on the candies, and use the rose again and again! If you wanted to get really fancy, you could have a cute little message glued to the inside of the lid. Like a sweet bonus when they go to snack on their treat! These were super simple, and would look great at place settings for a dinner party. Or at Valentine’s breakfast. Or as a sweet gift to a friend on Valentine’s day. Even if you told them, they wouldn’t believe you made it… and in just 30 minutes! The little honey pots from Freund Container really are the perfect shape for this project! If you’d like to make these, you can search your pantry for a similar jar, order the jars yourself, or enter this giveaway to win $100 gift certificate to Freund Container so that you can buy your own glass jars! They have lots of options when it comes to containers! 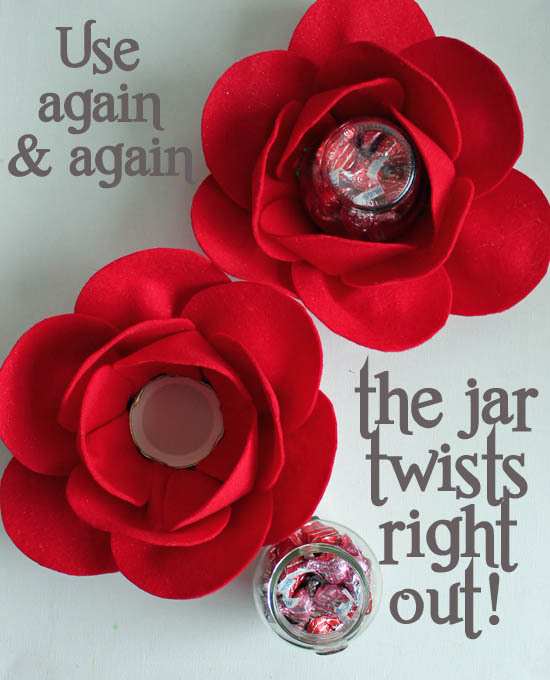 And if you want more fun ideas to do with jars, plus a second chance to win a $100 gift certificate to Freund Container, check out my friend Home Cooking Memories who is sharing awesome Mason Jar Valentine’s Gifts! I picked these jars from Freund Containers, and was sent them free of charge for this post. I love this sooooo cute!! Too cute! I love the idea and I just bought those same heart candies yesterday at the store! Thanks for sharing! Of course I like vday crafts! 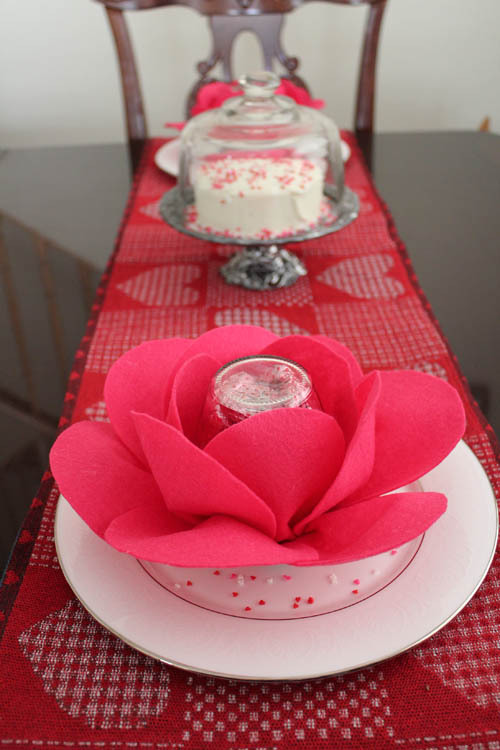 I like to do Valentine crafts, esp bc I have a Valentine-themed Pinterest party coming up! These are SO cute! 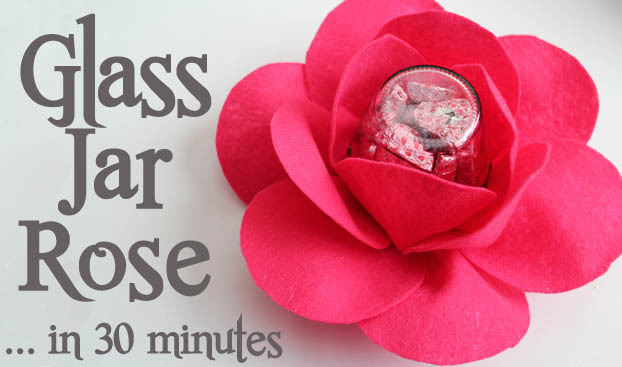 I love making special Valentine’s crafts for my kiddos, and I know they’d love these! 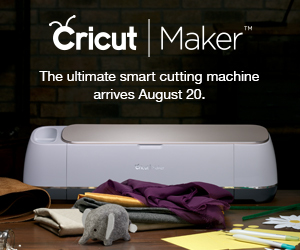 What a ridicously smart craft! I loved to when I was younger, but now having a child that is getting of age for crafts, my fire for crafting has been rekindled. I look forward to each holiday and the new creations we can make together. Yes, this is so cute — will decorate a nursing home counter with these. In fact, I will have the residents help make them. I like creating VDay things with my kiddos! 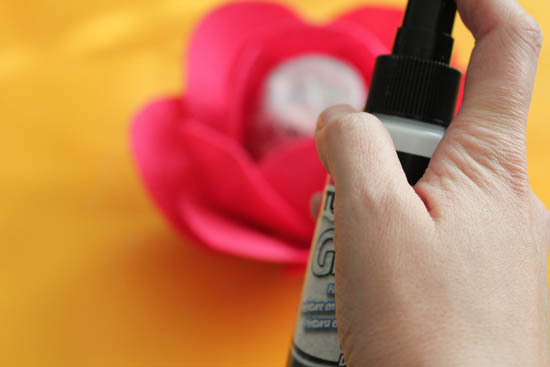 I love Valentine’s Day crafts and decor, but it is one holiday that I let slip through the cracks a bit if I’m too busy or stressed. I love crafting and love making super sweet Valentine’s gifts. What a great project! I am doing valentine crafting this year with a book page theme. I consider making cookies and decorating cupcakes crafts, so in that case, yes, I like to do V-day crafts! I love valentine crafts. I’m in the process of decorating my mantel! 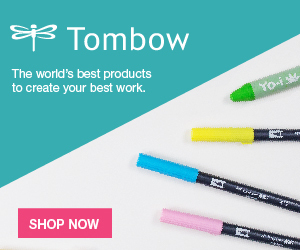 Yes, I love to make personalized gifts for my loved ones! I LOVE these! I really want to make them for my family this valentines day! Love this project, I’m going to have to make some! What is the size of the lid used in the instructions? Great idea Cara! I love it. 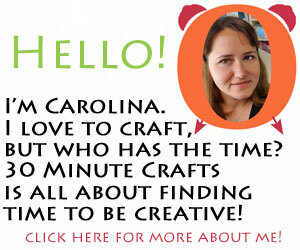 I am a Valentine crafting machine! I love to do crafts year round, but specially on Valentine’s day…I like to make the kids a personal valentine card! 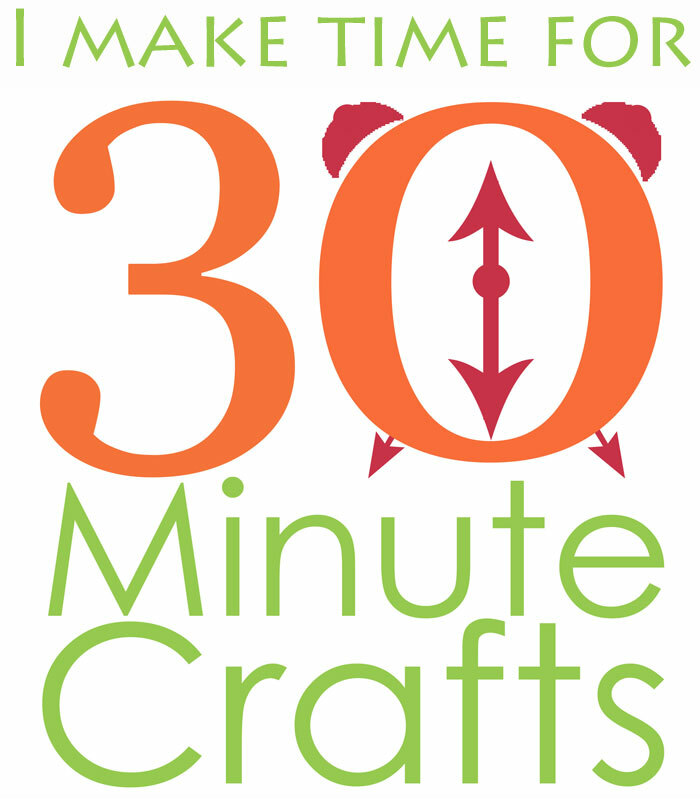 I love fast and easy crafts. 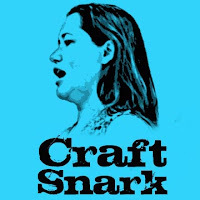 Now I have a new web site to visit for quick ideas. Thanks for sharing. I do enjoy doing Valentines crafts. Hey there! I’ve been reading your website for a long time now and finally got the bravery to go ahead and give you a shout out from Humble Texas! Just wanted to say keep up the excellent work!